What Exactly is a Criticalist? It might not be something you’ve ever heard of, but a criticalist is a specialist, like an internist, neurologist, or surgeon. In human medicine they are also sometimes called a hospitalist. Like other veterinary specialists, criticalists have to complete a three-year residency at an approved American College of Veterinary Critical Care (ACVECC) institution. Most residencies in critical care involve a large portion of time on the floor dealing with the sickest patients in the ICU under the guidance of a board certified criticalist, but as the name implies there is also a portion of time spent seeing primary emergencies. The specialty requires a large amount of collaboration with specialists in other fields like cardiology, radiology, surgery, internal medicine, and neurology. Before being able to sit and take the difficult certifying exam at the end of their residency, criticalists in training must also publish an article in their field in an accredited scientific journal. They are a true jacks of all trades. Criticalists have to be prepared for a whole range of patient conditions. They deal with patients with cardiac emergencies, respiratory emergencies, heat stroke, trauma, immune mediated disease and toxicology to name a few. In the world of emergency this is important, since there’s no telling what patient condition might come through the door next. Many days are filled with vomiting, diarrhea and broken nails; others involve emergency surgery, heart failure, open chest trauma, and bleeding disorders. But in general a criticalist is very important when dealing with the sickest of the sick. They collaborate with all of the other specialists. Criticalists work very closely with all other specialists in the hospital, and help call the shots in who is the sickest and needs to most urgent attention. At VESCNM our criticalists work closely with our surgeons and internist to make sure each patient is getting the best care possible. Many times a criticalist will help stabilize a patient when they first arrive, and once they are through the worst of their initial disease they will transfer to another specialist for long term care. When not sure which specialist might help a very sick patient most, sometimes it is best to have them come through the emergency department and that way the criticalist can help facilitate getting the patient the care from all or any of the specialists it might need. They deal with the sickest of the sick. The secret of happiness is variety. Many criticalists are drawn to the profession because they enjoy the variety of pace and cases they might see, constantly needing to be on your toes and ready for anything. Seeing so many varying emergencies keep things interesting for many criticalists: there is never a dull moment in the critical care unit! 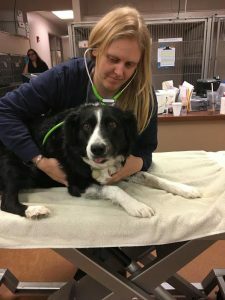 Dr. Clare Hyatt, DVM, MS, DACVECC and Dr. Lindsey Nielsen, DVM, DACVECC recently joined VESCNM to provide 7-day a week critical care coverage for the Albuquerque facility, and constant access by phone or in person when needed in Santa Fe. These two doctors are excited to help the hospital improve their patient and client care, and constantly bring in some of the newest and best treatments for the critical dog and cat patients that need them.